IFAI Expo 2017 heads to New Orleans with a full schedule of events, tours, workshops and meetings geared to the industrial fabrics sector. The Roseville, Minn.-based Industrial Fabrics Association International (IFAI) is busy preparing for IFAI Expo 2017, which will be held September 26-29 at the Ernest Morial Convention Center in New Orleans, La. Shade and weather protection — including end products such as retractable awning systems, shade structures, canopies and other weather solutions. 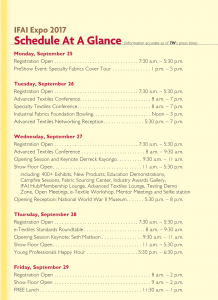 IFAI Expo features a packed educational conference schedule as well as a show floor with more than 400 anticipated exhibitors, equipment workshops and education demonstrations, campfire sessions, the Advanced Textiles Lounge, IFAI Hub/Membership Lounge, Fabric Sourcing Center, testing demo zone, Industry Awards Gallery, open meetings, and a selfie station. IFAI has added several new features to the 2017 edition of the show. Of particular note is the Smart Fabrics Program, which focuses on e-textiles and their applications. The program comprises an e-textiles workshop on the show floor with electronics and textile experts, easy to assemble e-textile kits available to all, an e-textiles standards roundtable and e-textile market discussions in an open forum setting; a Smart Fabrics Track at the Advanced Textiles conference; and the e-Textiles Hackathon Design Challenge. The hackathon is a contest created to encourage innovative new e-textile products with commercial value. It’s open to all entrepreneurs, developers, designers, students, engineers, artists, makers and creators who will be assigned to teams and tasked with innovating using only materials found in the e-textiles workshop. The hackathon is a free activity, but interested parties must register for the IFAI Expo/Advanced Textiles Conference badge and fill out the hackathon entry form no later than September 20 to be eligible to participate. Projects must be submitted by 5 p.m. on Thursday, and will be on display at IFAI Expo on Friday. Prizes will be awarded to the first and second place teams. Both attendees and exhibitors will be able to meet with independent experts at IFAI Expo’s Mentor Meetings. Appointments for the 30-minute meetings are limited and must be scheduled in advance. IFAI has put together a comprehensive list of mentors who will be able to discuss topics from advanced textiles development, e-textiles, environmental regulation compliance, fire protection, intellectual property law, and product and process development, among other topics. 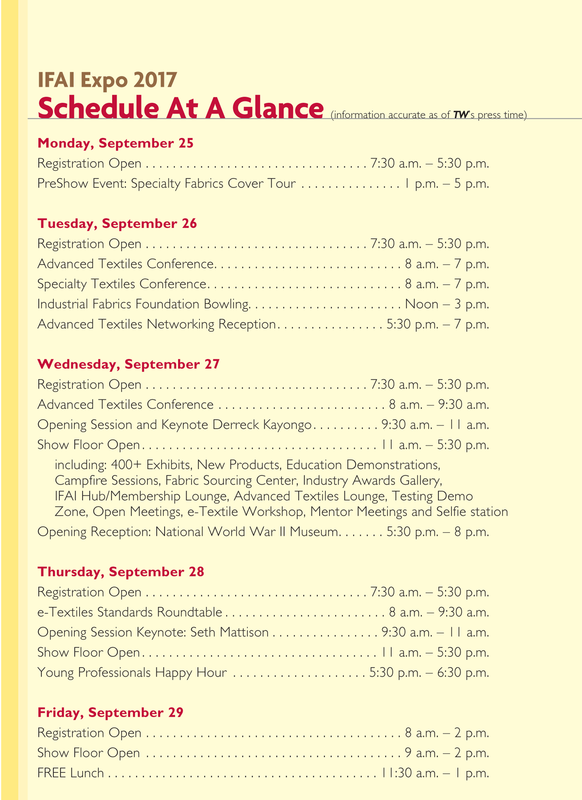 As in past years, IFAI’s Advanced Textiles Conference and Specialty Fabrics Conference will begin one day prior to the show floor opening, and continue on subsequent days only prior to the show floor opening to avoid conflicts in scheduling. The IFAI Expo Testing Program, inaugurated in 2016 in partnership with Raleigh, N.C.-based North Carolina State University (NC State), will return to the expo this year and includes two NC State certificate options, testing demonstrations and education, as well as new question and answer sessions. IFAI will again recognize new and innovative products and services found on the show floor with the Show Stopper program. The annual International Achievement Awards (IAA) — judged by industry experts, editors, architects, educators and design professionals — will honor innovation, technical skill and design excellence. In addition, the four Student Design Competitions sponsored by four IFAI divisions will recognize student talent in Advanced Textiles, Awning and Canopy, Fabric Graphics and Fabric Structures. The Industrial Fabrics Foundation also will present Innovation Awards in six categories with one achievement honored with a top overall prize. IFAI will host two keynote speakers at IFAI Expo 2017. Following the IFAI Annual Meeting, Tuesday’s keynote speaker Derreck Kayongo — a business visionary, Global Soap Project founder and CEO of the Center for Civil and Human Rights in Atlanta — will talk about bad life experiences and how they can reveal problems that need to be solved, or can point to a true calling in life. Kayongo will inspire the audience with his own life lessons and experience as a refugee and offer advice on how to stay relevant in today’s marketplace. Seth Mattison — an internationally renowned expert on workforce trends and generational dynamics, and founder and Chief Movement Officer of FutureSight Labs — will present the keynote speech on Thursday after the awards ceremony. His presentation, titled, “The Future of Work Today: Insights from the New World of Work,” is designed to help leaders prepare to navigate a new business landscape where the pace of change is elevating and collaboration is the key ingredient to unleashing the innovation required to compete and win. “We are excited to be back in New Orleans, a great venue for work and for fun. From our Opening Reception at the World War II Museum to our inspiring keynote speakers, networking opportunities and education on the show floor, IFAI Expo delivers the best and biggest annual event for manufacturers of textile products,” Hennessy said. For more information about IFAI Expo 2017, please visit ifaiexpo.com.